Dan Shak outlasted Phil Ivey to take down the $100,000 Challenge at the 2010 Aussie Millions for $1.2 million dollars AUD (which is about $1.08 million USD). Phil Ivey had a 1.38 to 1.06 million chip lead when heads up play began, but Shak was able to quickly wrestle away the chip lead and take down the tournament. With his second place finish in the event, Phil Ivey moved past Daniel Negreanu to claim the top spot on the all-time tournament money list. Ivey now has approximately $12.8 million dollars in lifetime tournament cashes, while Daniel Negreanu has $12.43 million. Jamie Gold, who held the top spot for a number of years after taking down the World Series of Poker main event in 2006, is currently in third place with $12.2 million dollars. The final hand of the tournament came when Shak moved all-in preflop against a short-stacked Ivey. Prior to the hand, Shak had about 1.91 million chips in his stack, while Ivey had about 500k. Ivey raised from the button pre-flop, Shak pushed in and Ivey quickly called. Ivey was now well behind in the hand, and would need to catch a ten to double up. The turn and river helped neither player, and Ivey was sent to the rail in second place. His consolation prize? A check for $600,000 AUD. 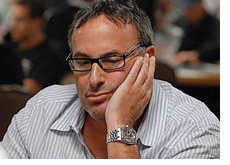 Jonathan Karamalikis, who entered the final table as chip leader, ended up bowing out in 7th place. With his victory in this event, Dan Shak now has approximately $2 million dollars in lifetime tournament cashes, and joins players such as Erick Lindgren and David Steicke as winners of the $100k Aussie Millions Challenge.